So, awhile back I was contacted by a company called SammyDress and they gave me the opportunity to review something from their website! 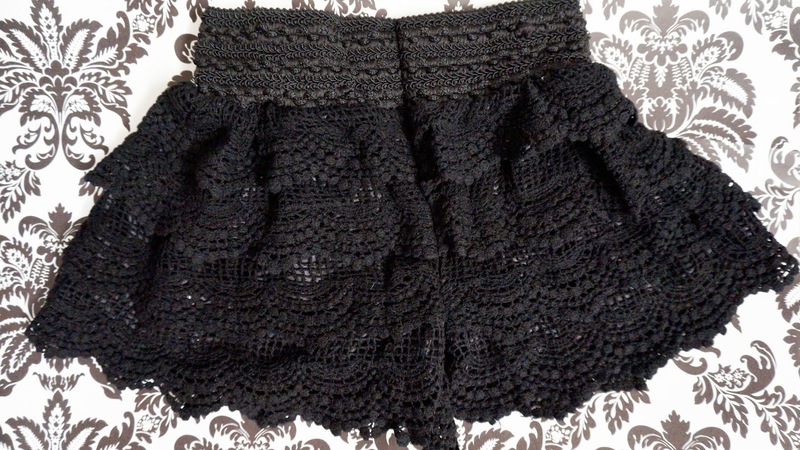 I chose these adorable lace shorts! I have wanted a pair for a really long time but I am super picky when it comes to things like this and luckily I found the perfect pair! As you can see they have an adorable decorative waistband and the shorts are made up of layers of the fabric. Underneath the shorts in a silky black material so that you cannot see through the shorts at all when wearing them! I LOVE the detail in these shorts, it's so cute and I love the waistband because you can tuck a shirt in and still have it look stylish and not unfinished! Here's a few pictures of me in them! These shorts fit PURRFECTLY, which means that if they were any smaller they would be uncomfortable for me and show some cheek. They are one size fits all, but the one size would be an XS/00 in pants. I am in love with these, and if you're little like me you will too! They do stretch quite a bit though so if you have wider hips then it should be fine, but I would suggest no bigger booty girls because you might be showing some cheek, which is fine if that's what you want! I absolutely love them and I would purchase them again! Below are the links to the websites and the shorts! And since I am lucky enough, I can offer everyone a coupon code for 9% off of their order! Just enter in "ITRYPARTNER" and receive 9% off of your order! * It expires on August 31st 2014!